After the massive box office success of Deadpool, 20th Century Fox is moving forward with Deadpool 2. Original writers Rhett Reese and Paul Wernick are coming back to pen the script, and Tim Miller has been confirmed to return as director. During the post-credit scene in Deadpool, Ryan Reynolds' title character confirmed that the iconic character Cable will be in the mix for this follow-up, but there is very little we know about the story thus far. As it turns out, though, if one actress gets her way, we may be seeing Lady Deadpool in the sequel. While promoting her new movie Ratchet & Clank, in theaters April 29, actress Bella Thorne was asked what seems to be a fairly common question these days. Does she have any plans to star in a superhero movie? 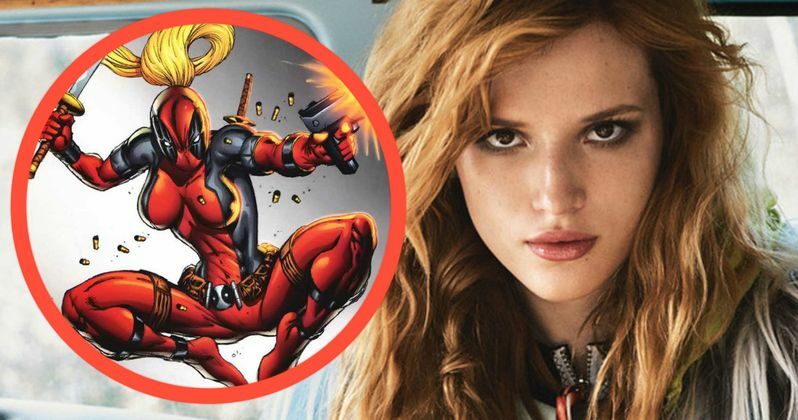 Most actors and actresses give a fairly vague response, but Bella Thorne seems to be gunning for one particular role, Lady Deadpool. Here's what she had to say, when asked what types of roles she'd be interested in, during an interview with MovieFone. "I'd be so down to play like a badass Marvel character. Any type of badass female in live-action, like Cora is in this movie. I also like playing roles that are very rebellious and real. So it's good when you really show teenagers for how they actually act and how they actually talk. Honestly, if I could just play a female version of Deadpool - any character that's a female version of Deadpool - I'm so down!" What the actress may not know is there actually is a female version of Deadpool, Wanda Wilson of Earth-3010, a.k.a. Lady Deadpool. Wanda Wilson hailed from an alternate universe, who became part of Wade Wilson's team of mercenaries in the comics. It's also possible that Bella Thorne could portray Gwenpool, a bizarre spinoff of Spider-Gwen who is actually a girl transported into the Marvel Comics who is living through the pages of these books. Of course, we don't know if any of these characters will be introduced in Deadpool 2 quite yet. Last week, director Tim Miller teased that he wanted to see a Spider-Man crossover in Deadpool 2, although producer Simon Kinberg said he didn't think that would be possible. Both Spidey and the Merc interacted several times in the comics, which proved to be quite popular with the fans. Still, Marvel Studios and Sony Pictures control the rights to Spidey, and it seems unlikely that they would put the web slinger into an R-rated adventure. But then again, anything is possible. It was announced earlier today that Deadpool comes to Digital HD next week.